Becoming parents is perhaps one of the most wonderful feelings any married couple could ever hope for. Everybody just gets so excited with the news about a family, friend, or a special somebody who is having a baby. And there is even more excitement when the baby actually comes out. The baby’s parents and other family members alike are just so excited to send and receive their birth notices. It is not all the time that people get birth notices and not all countries practice sending birth notices. What would you do if you get one? Knowing about birth notices will help you on how you should respond or treat it. 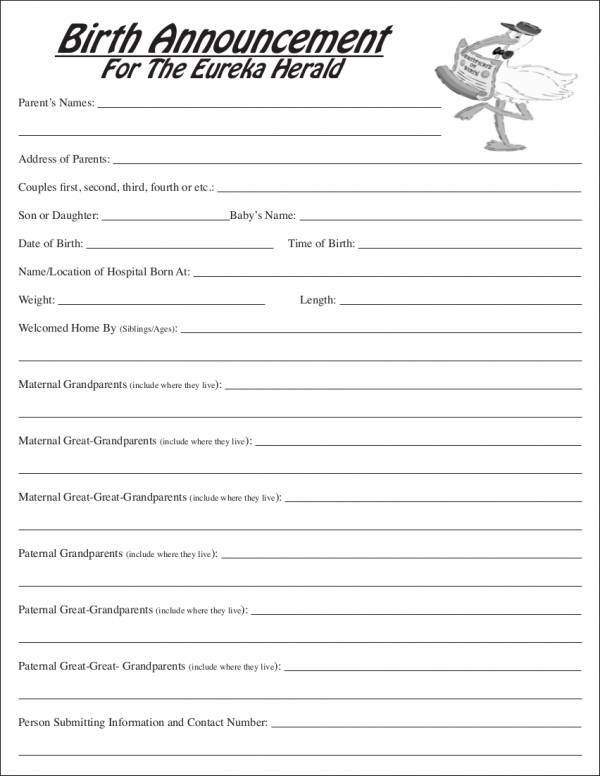 In this article are useful birth notice templates that are available for free download. These templates will surely make it easy for you to announce your baby’s birth. Check them out below! 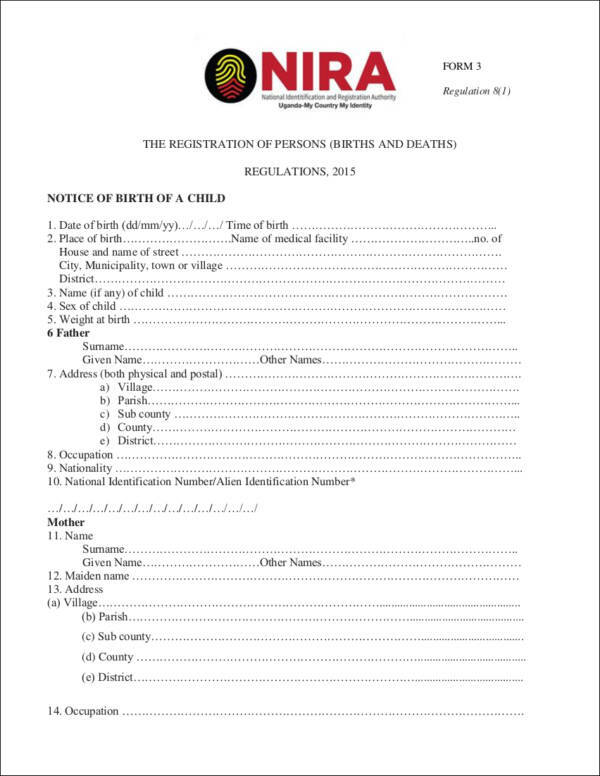 What Is a Birth Notice? As what it is called, a birth notice is a notice or an announcement about the birth of a baby or an addition to another member of the family. This is usually practiced to let family members and friends know that the little blessing that they have been waiting for has already arrived. This also gives family members a chance to meet their new little angel. Unlike other forms of notices, such as an eviction notice and late rent notice, which obviously brings bad news, a birth notice is one that gives more than good news. It brings joy to the whole family. What Are the Benefits of a Birth Notice? Why is sending a birth notice or announcing the birth of a baby being done? Aside from the fact that it provides a pleasant and wonderful news, birth notices provide benefits to those people who use them. Below are some of those benefits. It lets family, relatives, and friends know about the birth of a new member of your family. You are sharing to them a wonderful news that is a cause for a celebration or a little family gathering. It can be used in legal proceedings, especially when it comes to marital disputes. The announcement can serve as proof that a baby was born on a certain date to this family as these details are included in a birth notice. Disputes arise without any notice, that is why evidence or proof such as a birth notice is indeed helpful. It can be presented as one of the requirement document during a child’s educational undertaking depending on the state or county where he or she will decide to study. It can be a tool to validate the personality of an individual, which can be helpful during child travels where only a guardian is expected to accompany a child. It can be used by an individual to get government benefits or other advantages that are specified in federal laws. With a birth notice, family and friends will be able to prepare for a gift to give to your new baby. You not only let them know of a very good news, you also allow them to decide on a gift to give to your little one. Although this is not really asked by the couple upfront, it has been a practice by lot of people. 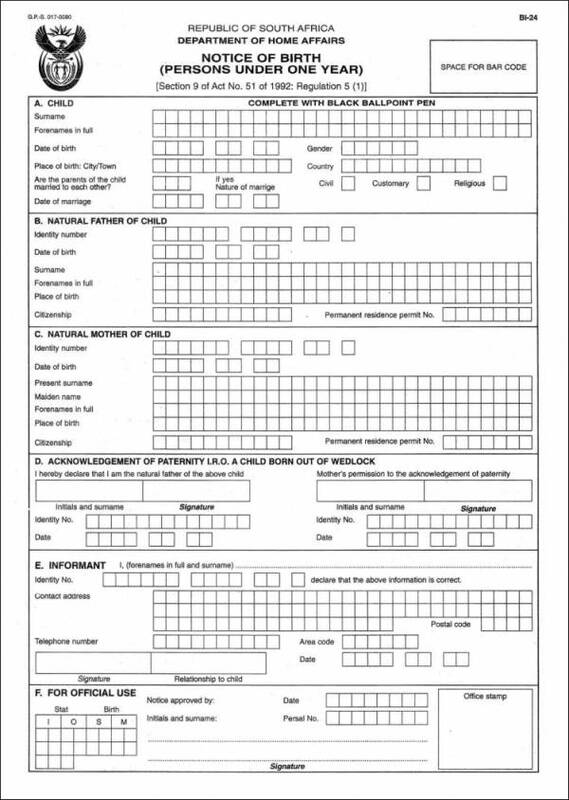 Notice form examples can be used for different purposes and that includes a birth notice. 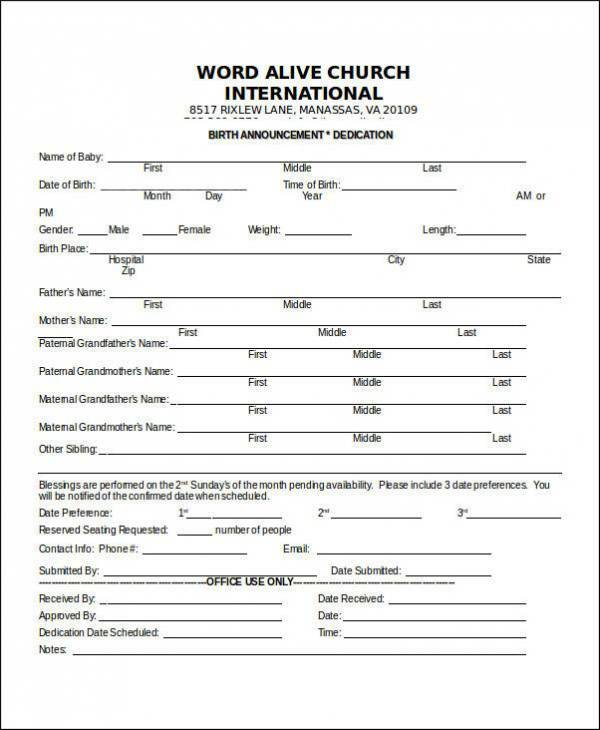 If you need this form you can always check it out on our website where you can choose a lot of different examples. You can even download them for free! 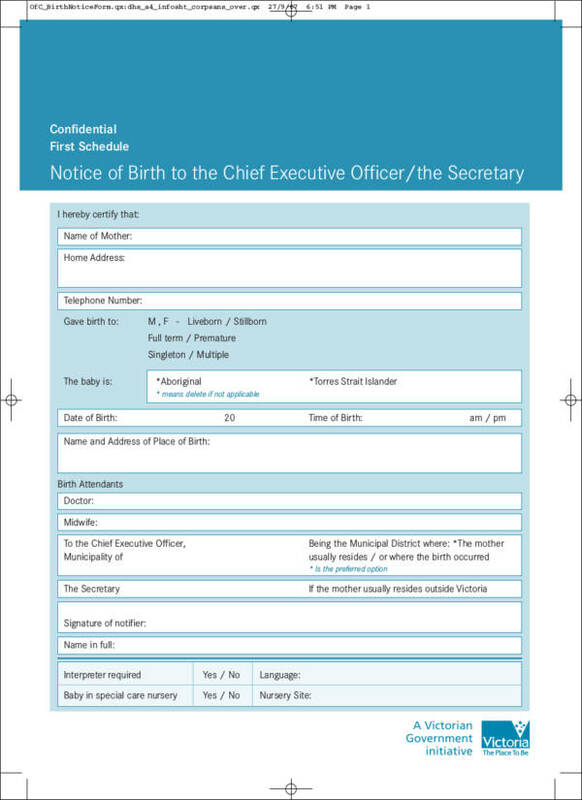 What Information Should Be Provided in a Birth Notice? You need not think hard and long about what you should put in your birth notice because you will surely come across a lot of things that you need to put. But you really don’t have to put in everything. 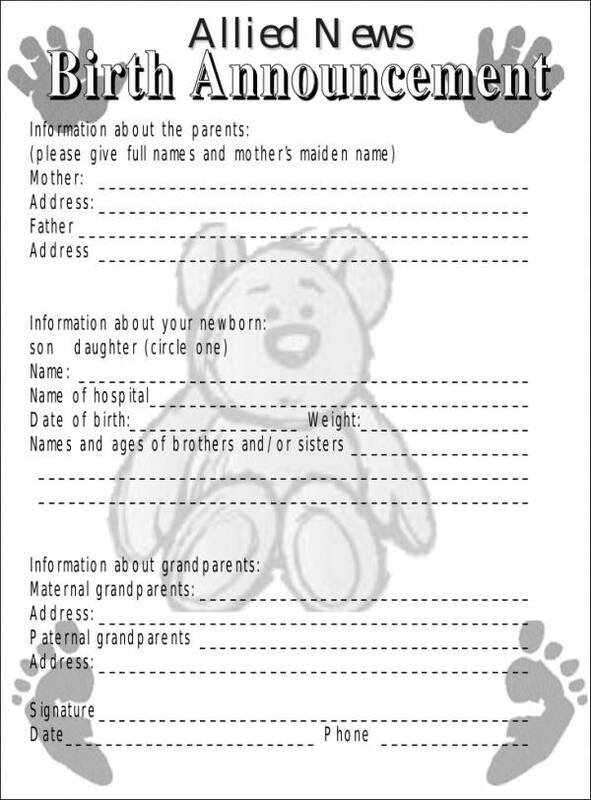 Below are some of the important information that you should provide in your birth notice. 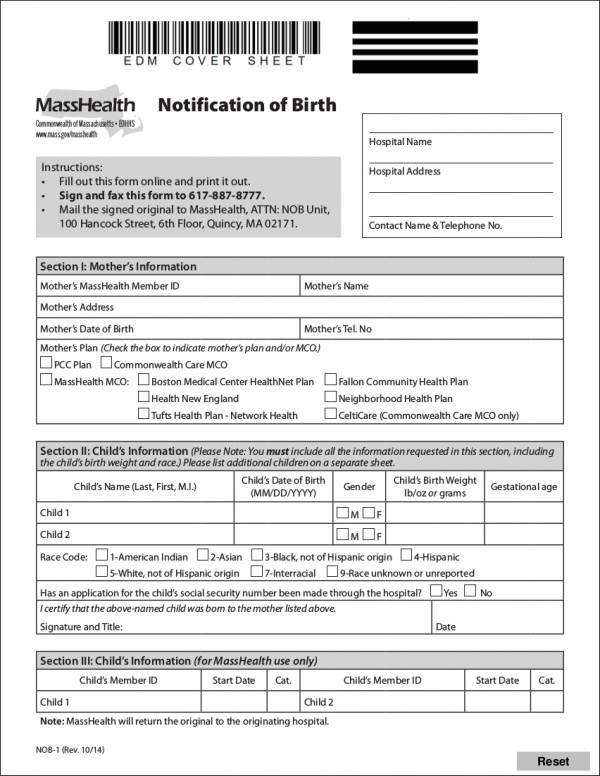 Keeping your birth notice short and simple is a great way to have your birth notice done, but you can still add additional information that you wish to include in it. 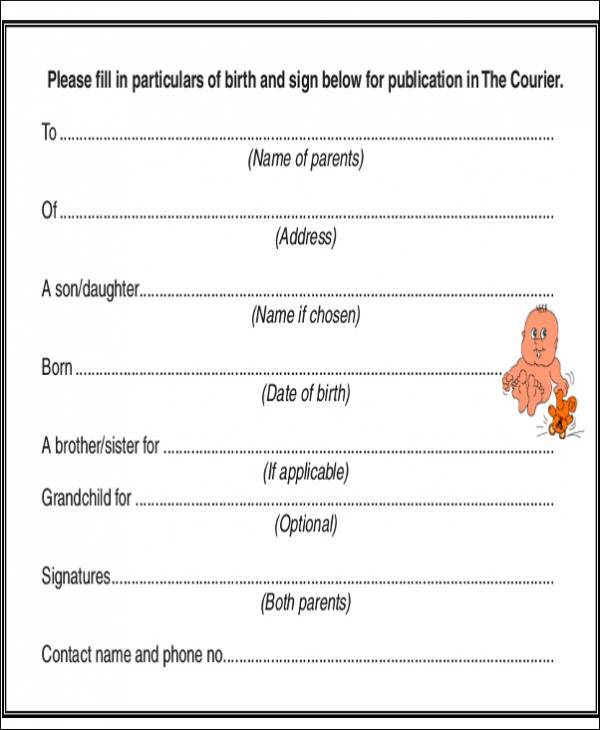 Ever tried doing a birth notice before? If not, then don’t fret as we will help you with making one using simple and easy to follow steps. In addition, we will also be providing you with useful and effective tips along the way. Step #1: Start with a sentimental message. Make your readers interested about the notice you sent them by starting off with a sentimental message. Although it is a sentimental message, it does not always have to be a dramatic message or an emotional message. It could be a catchy message or introduction such as, “It’s a boy/girl!” It’s an old one, but it works like magic every single time it is used. Step #2: State the baby’s statistics. A baby’s statistics include their birth weight and height. They can be expressed in any appropriate units desired by the parents. It can also be designed however the parents want it to be. 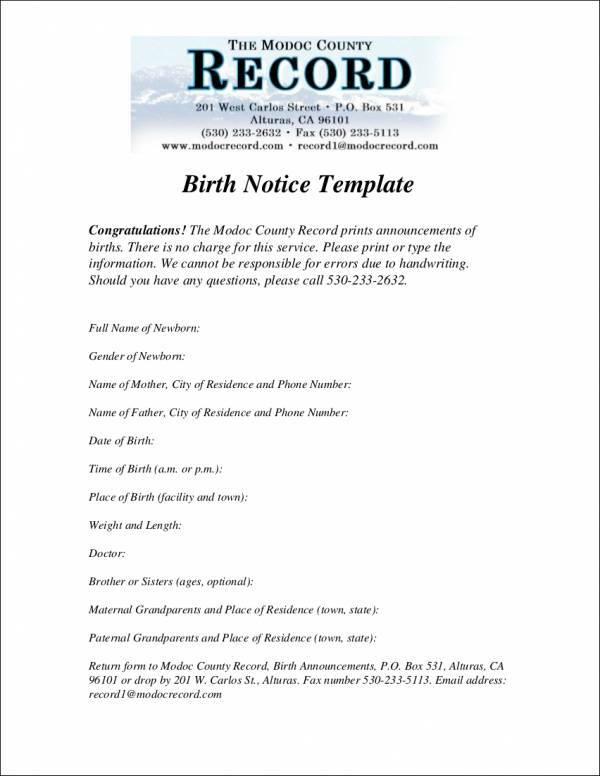 The date, time, and the place of birth are also important information that should be included in a birth notice. Step #3: Provide the name of the baby’s parents. Writing the complete name of the baby’s parents should not be forgotten as this is one way for people to know the origins of the baby or from whom the baby came from. And speaking of origins, nothing is more well-known than the grandparents’ names. This can also be included in a birth notice, which makes any grandparent super proud. Step #4: Share your baby’s name. Perhaps, the highlight of a birth notice is the name and the gender of the baby. This is a very important information and should not be forgotten at any cost. It is often written in bold or capital letters in a birth notice. Everyone has their own name preferences for baby names and it’s just normal that they give you choices on what name to give to your baby. They’ll be excited to find out which name you have used. Step #5: Provide additional information. If you still have more free space in your birth notice, you may include information such as the health condition of the baby and how they have been doing, and when they will be going home. Step #6: Include the names of the baby’s siblings. Sometimes other siblings feel left out when a new baby arrives, especially those who were once the youngest child who gets a lot of attention. Including their names in the birth notice will definitely make them feel special and feel close to their new baby brother or sister. Step #7: Send it to family and friends or to your local newspaper. Make sure that you have proofread and checked the spelling of your work before deciding that it is final. 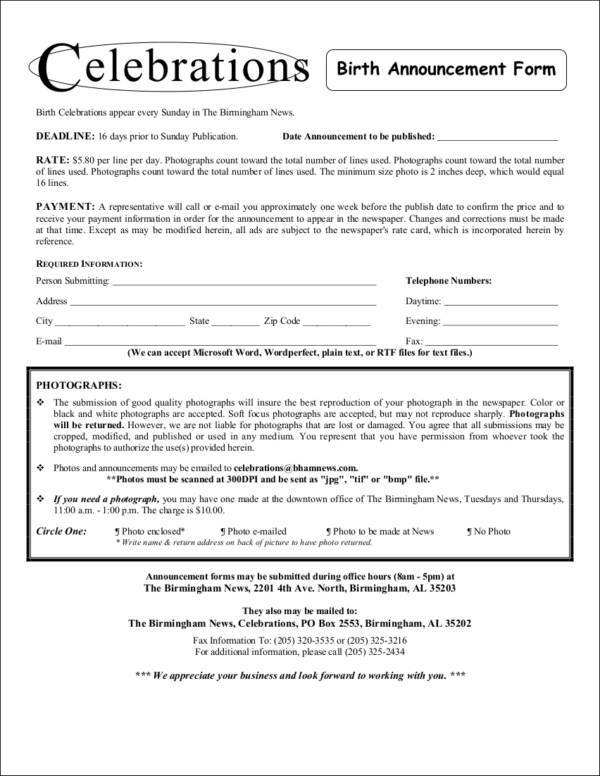 Remember that you will be sending to family and friends or to your local newspaper, so it should be error-free. It would be embarrassing if there are any mistakes. So now you can finally have it sent for all the people to know. 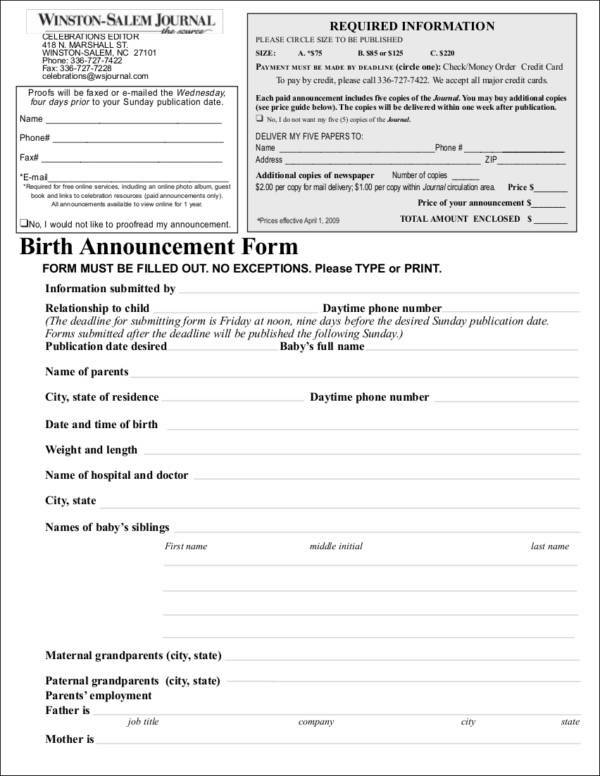 When Should You Send a Birth Notice? There is definitely no deadline as to when you want to send your birth notice or birth announcement to your family and friends. But if you really want to know the ideal time to send one, that would be a week or two after the baby comes out. Why not right after the baby comes out? It would be nice to be able to do that, but giving birth does not always come easy for some and the arrival of the baby will keep everyone in the family busy. There are different uses of notices for different purposes and they are final notice, adverse action notice, resignation notice and many more. Each of these notices, although used for different purposes, their main goal remains the same and that is to notify and announce something.